Two More Seasons of FNL?!? Can this really be happening? 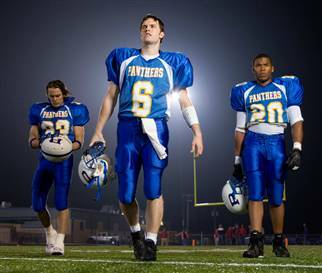 Is NBC finally showing Friday Night Lights the appreciation it deserves? Sources have confirmed to Michael Ausiello at EW that studio is actively trying to renew FNL for TWO MORE SEASONS!! “NBC is engaged in active talks with DirecTV to extend their unique shared-window experiment with Friday Night Lights. But there’s a catch — and it’s a good one. According to an insider close to the negotiations, DTV and NBC might only seal the deal if they can get – holy Connie Britton Taylor! — a two-season pickup. Since this renewal is very definite possibilty, I guess I have to accept the fact that Tim Riggins graduated from high school and has left Dillon.